Photo sharing among friends is simple enough via social media, but not as easy when at an event where you may not be linked to everyone in attendance via Facebook. To help change that, there’s Slide, a new app that uses Bluetooth technology to send and receive pictures. 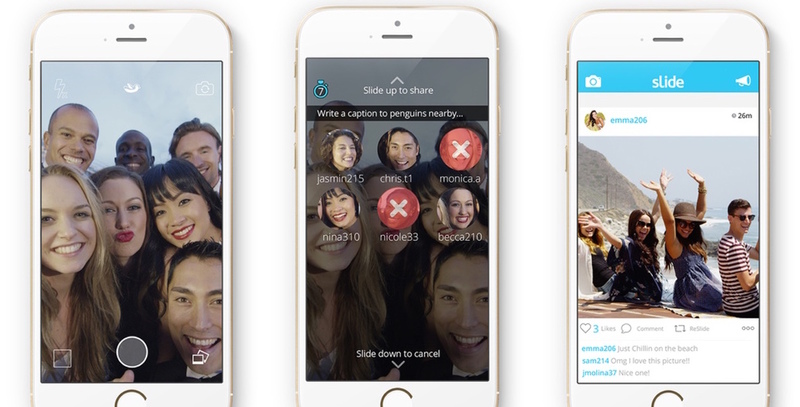 Slide works via a simple two-step process; take a picture, then slide up to send the picture on its way. By default, you’ll see everyone in your vicinity (who also uses the app) on the send screen. If you only want to send the pic to a select few, just choose them from the list and your sharing will be much more private. Slide doesn’t ask that you add any users as friends, either. It uses iBeacon technology to send pics to anyone up to 200 feet away, and any interaction beyond being in the same area as someone (exchanging Twitter handles or adding them as frineds on Facebook) is entirely up to you. It’s a great idea for events — like weddings — but it’s also easy to imagine Slide being abused. At least with iBeacon technology, you can literally get away from the creeps.